Have you seen this year’s HGTV Dream Home in California? Architect David Bourke gave the 3,200 square-foot house “new mountain style” with a mix of traditional, modern, and industrial elements. I love all the big windows, which is exactly what you want in a home with a view. The two-story section of the home houses the master suite, family room and guest rooms. 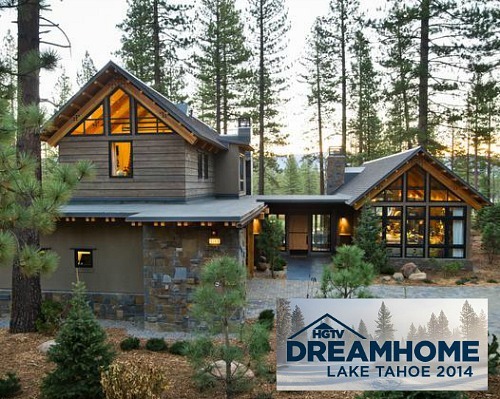 HGTV’s 18th annual Dream Home is located in the Schaffer’s Mill community of Truckee, California with panoramic views of the Carson Range between California and Nevada. Visit HGTV.com for all the photos by Eric Perry and more information. Rhoda of Southern Hospitality got to tour the house in person, and you can see the photos she took of it on her blog, too. And, of course, watch for the special airing on HGTV! Want it? The winner gets the house (estimated at about $2 million) along with the furnishings, a $250,000 cash prize provided by Quicken Loans, and a 2015 GMC Yukon Denali. You can enter twice a day — once on HGTV.com and once on FrontDoor.com. Will you be entering to win? Do you like this one better than last year’s “Low-Country Zen Cottage” in South Carolina? I hope and pray that I’m the winner and I been enter now 15 year and not yet won but I hope this time to win from Alabama in berry ala. in Fayette county. Cool house! They really worked to showcase the views. I love love the kids’ room, and the fake dog in the little dog room cracked me up! Me too! My greyhound would be compelled to smell it’s bum, though. 🙂 My two cats are hoping we win this one for the open rafters–climbingpalooza. Yeah, that would be cat heaven! Ha. This is my favorite dream house of recent years. Really beautiful. There are always things in these houses that are too trendy for me, like sitting at the dining room table in a bright yellow wing chair. Just can’t do it. But honestly I could move right in and happily sit on that leather sectional for the rest of my days. Great job. Remind me, has anyone ever actually lived in a Dream Home they’ve won? I think not. To me, it’s a concept that is fraught with waste as few Americans can move to wherever the Dream House is, let alone afford to maintain the lifestyle. I see this year the winner gets $250,00 in cash as well which must be to pay for taxes etc. Someone from modest means is all of a sudden thrown into a higher tax bracket owning a million dollar home. I don’t get the excitement factor. The houses are pretty but that’s about all. You’re right, sounds awful….I’m willing to sacrifice and take that prize, just to save everyone else from the horror. That’s the kind of person I am! If memory serves, there have been one or two winners who actually took up residence in past Dream Homes, but eventually sold them because of taxes and other expenses. Thanks for doing the math for us, Dean! I meant to go over to their site and look it up but hadn’t had a chance yet. Dean I think you need to show your work. Beautiful house and decor! But honestly, when I look at homes like this all I can think of is how much work it would take to keep clean! ha. Beautiful, but……..all I can think about is trying to clean all those blocks of wood that are supposed to be decorative on the wall! Oh, what I forgot your a millionaire just hire someone !!!! ha. Auto-correct ??? What is supposed to be wait! Silly. I think it’s pretty much a given that the winner of the home will immediately put it on the market…at least I believe we discussed that in another HOH dream home thread within the last few years. My memory – gah! Didn’t we even discuss that HGTV helps with that process, so it’s a win-win all the way around? You’re right, Cindy — most people do sell it after spending a vacation or two there or they rent it out. They’re giving the money to help with taxes and other expenses. I think they try to make it as easy as possible. I believe you usually have the option to take money instead of the house, too, but I don’t remember reading if they’re doing that again this year? If that’s all true, then what exactly IS the point of the Dream House? It might bring a temporary sales surge for a product/paint color/fabric/piece of furniture in the home, or a surge for travelers to that particular locale, or the architect or interior decorator might get a few calls, but seriously, I see the build as totally wasteful. What am I missing? I think these houses are great showplaces for design. The architects and decorators always seem to do their best to try something different and interesting. In that way we all benefit from it. The giveaway gimmick is just a well proven method of drawing attention, getting press and so forth. This one is so pretty and the area is fabulous. But my one quibble would be that that glass box foyer seems a huge waste of space in a house that is only 3,000 square feet. Not that a 3,000 square foot house is small, but that foyer must be nearly 800 square feet all by itself…a huge percentage of the total. I think I’d rather have a couple of extra bedrooms. Usually when I see the tag “industrial elements” I know I’m not going to like the house but this one surprised me! They kept it logical and mixed it well. Not a fan of the chrome yellow accent stools but I do appreciate how comfortable the seating looked. Wow, what a gorgeous, thoughtfully arranged kitchen space. And can I just say how much I appreciate a mountain house that the decorator did NOT burden with dear little animal heads and antlers on the walls? Finally, LOVED the bunk room! A tiny quibble though- that red and white striped carpet is not going to hold up. Not in a kid room, no way. I surprised myself by really liking this one (the Dream Homes are normally too modern for me) – it’s beautiful. And I love that the dog gets his own room! Finally a home that is not all the way across the country from me! Living just a short 1 1/2 hours from this year’s dream home makes my decision to keep it (if I won!) a no brainer!! I can envision, many a family vacation in this home for years, and years to come. And in the interim renting it out when not in use would be a good option to help offset costs. A couple of months ago I had a dream…I ended up telling my friends that I had a dream that I would own a home in Lake Tahoe. Grace asked me what side of the two states I wanted to live in. I told her California. Even if I don’t win…I enjoyed having that dream. How great would this be for a senior and my three children along with my four grandchildren. If I would win….what a God send. That would make for a great story if you did! Which home would I choose? This Truckee/ Tahoe one over the South Carolina one any day! It is gorgeous! What does it mean when you say…Your comment is awaiting moderation ?? It just means I haven’t approved it yet. I get an email saying someone left a comment and then I have to click “approve” before it shows up in the thread. I LOVE this house. Love the blend of rustic and industrial/modern. I’ve been entering HGTV’s Dream Homes, Green Homes, and Urban Oasis’ for a looooong time. Each one has provided a lot of inspiration and dreaming. 🙂 As I explained in the reply above, these come with a cash option which enables the winner to renovate their existing home, buy or build a new one, or pursue other dreams. Btw, I love all the furnishings and the yellow accents downstairs – as someone above said, they look so comfy. Love, love, love the very expansive 16′ kitchen island. My only quibble would be with the industrial tin on the wall in the downstairs hallway – it’s just not my taste. I don’t like it. The decor seems messy, in need of editing. I always enter the HGTV dream home contests and the other…the green house, the urban apartment, etc. But this time it is much harder to enter…you have to fill in every line every time for entering both times allowed daily. The last time the site remembered you and filled in the info for you automatically. It was the easiest ever. Why the change? Saw one complaint that it was really hard for elderly to remember all the info. Fortunately it just is taking more time for me. I agree that I really like the absence of all dead animal heads and horns. I can see this home fitting in the Australian bush very nicely! The expansive living area and large windows really take advantage of the view. Only problem is, being here in Oz means I can’t enter! Interesting comments about the winner having to pay taxes. Here in Australia, wins from competitions, lotteries, raffles, etc are tax free as they are regarded as ‘windfalls’. You would still need to pay council rates, but the property itself would only be taxed if it was sold – and only then if it was not your primary residence. Interesting! I didn’t know that. Thanks, Paul! the living space in this home is just great…would accomodate a large group as well as being cozy enough for a small family. love the dark wood, some of the lanterns, the flow of the space and, that bunk room! the other two bedrooms were beautiful, but look a little too slick for my taste in a country/mountain home. the decor is trendy, but on trend and tastefully done…nothing that could not be changed out in a few years when fashions change. A big issue with keeping a property like this, is, in addition to the upfront taxes is the ongoing property tax burden (not to mention any required club dues and HOAs in the community). It’s a lovely house but I’m shocked that not only is there only one guest bedroom in such a large home, but it is so small that that full/queen bed has to be pushed against the wall! There must be some limitation in the subdivision so as to prevent large groups from renting out and getting rowdy. You know when ever I think of Tahoe, I just dream of a golf course view. Wasn’t the Corleone compound in “The Godfather 2” on a golf course? You think I could get store credit from Ethan Allen on the Yellow leather bar stools if i clean the blood off them from hitting a knee on the steel legs that hold up the bar? I have not liked the interior design of any of the Dream Homes in recent memory; and the wood blocks glued to the wall… well that’s a $6k (re-texture and repaint) fix. One nice thing is the HOA has a shuttle to a decent ski hill, for now. And yet I have two tabs that open every morning so I can enter. I always love your comments, Billy. Too funny. Yes those legs on the bar sure limited the seating. Also, I’ve seen those wood blocks done in the 70’s…a few yrs down the road they are falling off the walls. I do like this house a lot. We are entering though I have no desire to live full time in CA, BUT we have family there so it would be nice to have a place to all meet which makes this house perfect. Plus being in NJ, snow does not faze me and they get good amounts there. Overall, this doesn’t appeal to me, though there are some elements I like. The colors (dark gray, particularly), decor, and industrial edge don’t feel warm and cozy to me. And I love mountain houses! The 4 TV’s in the bunk room made me laugh (it’s on the website tour). Does everyone watch their own show/play their own game with some kind of earbuds? Not really bringing people together, is it? I got a kick out of all those TVs in the bunkroom, too. Wouldn’t want to have to share! Ha. I loved the 2006 dream home, too, but hadn’t heard the sad story of how things turned out for it. Fun to see those photos of it again this morning. It really was beautiful. Thanks, Carolyn! Well, I’d take it in a heartbeat. I love it! I agree, dreams are free. Also, my dreams include windows that are eternally spotless, which is a plus! Wouldn’t that be nice? My windows are looking pretty spotty right now! Ha. Really pretty house, I could live there… Well if I won id stay for a month enjoying it and then sell it as I couldnt afford it either. But even paying all the taxes etc. you are still left with more than you started with, so yes I enter every day. Id keep the truck though, my old one is 21 years old! Glad to see some nice simple window coverings and no blinds! I was amazed when I first saw the promo’s for this house. It’s in the town I live in. Probably about 10 minutes from me, as the crow flies. It’s in a private community and I imagine there are some pretty hefty HOA fees that will be coming along with the home. I love that it’s marketed in Lake Tahoe, because it’s about 30 minutes from the lake. They certainly could have chosen a lot much closer to Lake Tahoe, but the price would have been MUCH higher.And their website said “Lake Tahoe, California” which is not an actual town/location- oh, those marketing wizards. I’m definitely entering the drawings but I find the design choices to be quite off putting. The different styles layered with one another don’t seem to be done well. The canary yellow is jarring. Everyone loves a great bunk room, but the red is a bit over done. The black leather bed looks terribly cheap and medallion mirror is far too trendy. I’d need to edit the house by about 50%. It is quite cold here 6-8 months of the year, and I find the materials chosen on the house feel far too cold for the climate. Truckee holds the national title and records for having the greatest variance in temperature in any one day (you’ll wake up to 4 degree weather, and it will be 47 by mid day). When you wake to temperatures of 8 degrees, you do not want to be walking down stone corridors, holding onto metal railings, etc. Warmer materials, please! My favorite home was their Utah house- loved it. Interesting! Thanks for the additional information, Meg. Meg, I had to smile too when they called it Tahoe given it’s a half hour to north shore and when most folks think Tahoe, they’re often thinking about south shore. What gets me and I’m surprised nobody has mentioned it…I fear the heating bill! Double height ceilings and all those windows/outside walls. This is close to Donner Party territory, it’s gets some serious weather there. Also not sure if any of the fireplaces were wood burning, the living rm firebox seemed very small, though gas only could be a regulation issue, but I’d thought they’d ease up on that in the mtns. Omg, so beautiful and good design. So comfortable and warm interior. Well, even though I fear the heating (and HOA) bills…this is the nicest dream home I’ve seen in a long time. It’s very livable and doesn’t have weird things like a master bedroom outbuilding and kids rooms on the 3rd floor with an open railing for them to fall through. The design here makes sense. Even if you had little kids you could make the bunk room into a master/guest into kid room till they got older…the floorplan is workable. The H style floorplan is one of my favorites with immediate access/view through from the frontdoor to an outside courtyard beyond. Not much I’d change here, I’d like to see a bigger real fireplace in the living area, but as mentioned above it could be regulations. So that just leaves the tin wall…not a fan. I’d prefer plain wall or full height bookshelves, but gotta say this one is sure a stunner. On the website there are a few outdoor shots in the snow that look simply magical. So, much so been thinking of driving over to take a look see. I’d take this one in a heartbeat, just wish I’d be able to afford to keep it – now that part really would be the dream. Love the location and architecture …as usual I could do without some things (like the yellow chairs and waterfall countertops – just not my style). I love HGTV and watch it all the time. My husband looked up the area/subdivision this house is in and it is definitely one of the “less expensive” homes there…surely even with the $250,000 would be hard to maintain the lifestyle of an area like that for the average American. I myself think HGTV could still do a “dream” house but make it so someone who wins could actually afford to keep the house. I’d also like to see them switch up the interior designer …most of her decorating I like but it tends to look the same year after year to me ..just a different location. It’s not my favorite, but I would take it! I really wanted to win the Vermont house a few years back because it was within a few hours of where I live which would be a lot more doable as a vacation home. I love the house, it would be perfect for my husband and I, we are retired, love the out doors and love to ski. It would be so much fun to spend the day fishing or sking and be able to come home to this beautiful home. I would feel truly blessed. I actually liked the cottage from last year better, but If I won I this one I would not throw it back in their faces either. This “Lake Tahoe” house is one of my favorite of the last several dream homes. Some of you who are locals have commented that this is not near the lake, but for the rest of us, it is a handy landmark as to where the house is. And as for the hassle of taxes or selling it, I would be happy having that as a “problem”! I love the floorplan, and most of the features of the house itself, and even though not all of the furniture is my taste, I would gladly stand in front of a camera and say “thank you” for the house and everything that came with it. We have already discussed moving, and agreed that we would sell our current home and relocate to live there. The area is great, and I could deal with the weather as it came. OK, time to submit another entry form! Also, thank you HGTV for this annual sweepstakes. Even thought we haven’t won yet, it’s fun to dream and has given us some great ideas for our own home design, both now and for the future. If I won, I would want to stay in it at least for 2 weeks of vacation 🙂 then it would go on the market. Interesting to hear some of the critiques of the house. Honestly, I think it looks great though. It has the appeal of a cozy winter cabin in the woods, but with a modern twist. I don’t mind that it’s not in Lake Tahoe proper – it’s still in a lovely area. I love the open floor plan and big windows – you really end up feeling surrounded by nature! If HGTV gave it to me, I wouldn’t mind one bit! Love this house! I’ve fallen in love many times with the “Dream Homes” and entered for several years. However, I would be concerned about the heating situation in this house set in the mountains above Tahoe, especially in the winter. Questions: Will the foyer be especially chilly as it’s clad on two sides with glass? What kind of heat is built into the house (radiant floor heat, perhaps? ), and what kind of glass (triple panes?). Does anyone know where to find this info on the website? Sorry, I don’t know, but you’d think they would address it somewhere on their website! I hope to all good luck, meaning if none of you win this home, I hope u all find a dream home. But remember, all this is material. Nothing is much much better than your family. Believe me, this sure is is dream home is all my wishlist. It’s so funny that before seen this home, I have my kitchen with yellow decoration, my kids room is red and white as well. And last. Not to long ago I had two car accident with my kids and rented a Yukon n since then have been wishing to get one. So therefore this home sure has everything I need for me n my kids. But let’s all put it in gods hand and hope the winner thank God for this. For the mean while I’ll keep looking at picture from this beauty of home. It’s funny that if hgtv ask me for details about this this home I’ll know everything. I’ve seen this pictures over n over even saved them to my ph. That’s how bad I love this home. Good luck my ppl. N thank u hgtv for making dream homes. any idea what the yearly property taxes will be on this home? I was fairly impressed when I came across this wonderful dream home. The architecture that you have used in this home is really eye-catching. Trees and plantings around this house acts as a fence, which not only beautify this home but also enhance the exquisiteness of this house. Nice share.